Studio Athletica | Downtown Toronto Shockwave. Direct Billing. Same Day. Our downtown Toronto Shockwave Therapy uses the EMS Dolarclast Extracorporeal shockwave therapy (ESWT). 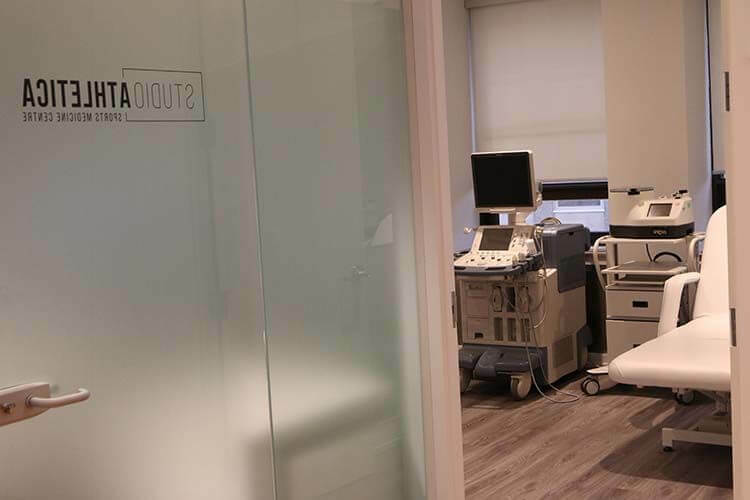 As Studio Athletica, we use the most evidence based shockwave and is a treatment used in physical therapy, orthopaedics, urology and cardiology. The shock waves are abrupt, high amplitude pulses of mechanical energy, similar to sound waves, generated by an electromagnetic coil or a spark in water. It has emerged as one of the leading treatment options for patients with chronic neck and back pain. Our Downtown Toronto shockwave therapy uses acoustic waves with high energy, when applied to the area causing pain and interacts with tissue, it causes an overall medical effect of accelerated tissue repair and cell growth. Thus, promoting faster and a more natural way of healing. Acoustic waves with high energy peak are used in your downtown Toronto shockwave therapy. The energy waves interact with tissue causing overall medical effects of accelerated tissue repair and cell growth, analgesia and mobility restoration. All the processes mentioned in this section are typically employed simultaneously and are used to treat chronic, subacute and acute (advanced users only) conditions. 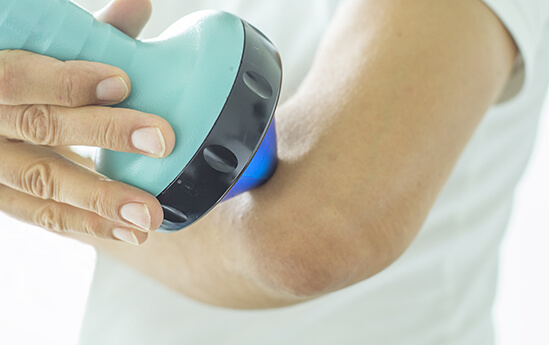 The focus of our downtown Toronto shockwave therapy is to provide a non-surgical approach to immediate pain relief and restoration of mobility. This is accomplished without the use of heavy medications, injections, or painkillers which promotes faster recovery a faster recovery time and a cure for various problems causing acute or chronic pain. What to expect during your downtown Toronto Shockwave visit? The process is simple and causes slight discomfort. During our downtown Toronto shockwave therapy session, your chiropractor or physiotherapist will use palpation to help locate the exact area that needs to be treated. A gel will be applied to the area. The gel is merely to allow the shockwave applicator to move without friction directly on the skin. To begin your downtown Toronto shockwave treatment, the shockwave applicator is slightly pressed onto the treatment area and then powered on. Some patients feel a slight tingle or discomfort that is certainly tolerable, more tolerable than the pain they may have already been dealing with due to their injury. The intensity could certainly be adjusted and discussed with your chiropractor. The entire session takes only a few minutes however, frequent visits may be needed. Facet joint syndrome is pain at the joint between two vertebrae in your spine. Another term for facet joint syndrome is osteoarthritis. Facet syndrome can be caused by trauma, such as a whiplash injury of the neck, it is not uncommon for athletes who participate in contact sports to experience some degree of facet syndrome as a result of considerable motion and excessive force to the body. One of the most effective treatments for tendinitis at our downtown Toronto shockwave therapy. The most common tendinitis is rotator cuff tendonitis and pain at the heel called plantar fasciitis. Also known as compressed nerve, develops when one or more nerves are compressed or constricted by a bone, muscle, cartilage, or tendon. Although most people associate it with the neck or back, it can happen anywhere. Pinched nerves can occur in areas that are overworked such as, the elbows or wrists in tennis players. Regardless of the location, the common symptoms are numbness, tingling sensations, increased pain when walking, standing, twisting, or lifting. Thoracic outlet syndrome is an injury that involves the compression of blood vessels and nerves that extend from the neck to the shoulder. It can feel like continued pain and numbness in the shoulder and throughout the arm, and it is often difficult to diagnose. High-performance athletes such as professional baseball players have suffered from this type of injury because the sport involves frequently moving in a motion that raises their arm(s) above their head. The downtown Toronto shockwave therapy program is the gold standard.